July 25, 2013  With a potential blowup over executive branch nominations defused for now, the Senate may next have to wrestle with judicial nominations. President Obama wants three appointees to the powerful District of Columbia Circuit Court of Appeals approved quickly, but Republicans question the need for any more judges there at all. The impasse may bring the chamber to another showdown over the use of the filibuster. July 24, 2013  A House subcommittee Tuesday discussed possible legislation to grant legal status to people who entered the country illegally as children. The hearing offers a clue to the direction House Republican leaders may take in response to a comprehensive immigration overhaul passed by the Democratically controlled Senate last month. July 20, 2013  This week, Democrats dropped their threat to change Senate rules and strip the GOP minority of its right to filibuster executive branch nominees, and Republicans allowed up-or-down confirmation votes on several stalled appointments of President Obama. Here's how it happened, and why some think it might not last. July 17, 2013  Democrats had been preparing to change Senate rules on filibusters to push through President Obama's nominations to executive branch positions. Republicans agreed to allow votes on five nominations, and Democrats agreed to replace two particularly contentious names with others. July 16, 2013  Senate Majority Leader Harry Reid and his Democrats took their support for President Obama's executive nominations to the brink of the "nuclear option," but then cut a deal with Republicans to pull back. July 16, 2013  Senate Majority Leader Harry Reid is preparing to push through contentious changes to filibuster rules, if Republicans do not agree to approve seven presidential nominations on Tuesday. 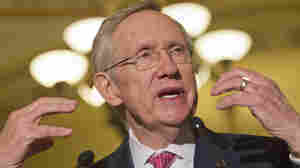 Reid convened a closed meeting of all 100 senators Monday night to hash out the arguments ahead of the deadline. July 12, 2013  Senate Democrats are once again threatening a rules change to allow President Obama to win approval for his executive branch appointments on a simple majority vote. Republicans complain that this strike against the filibuster is both unfair and a bad precedent. July 11, 2013  Senate Democrats appear so fed up enough by Republicans blocking President Obama's appointments that they are preparing to change Senate rules. The so-called "nuclear option" would end the use of the filibuster when it comes to appointments, dramatically diminishing the power of the minority party in the chamber. July 11, 2013  House Speaker John Boehner convened a closed-door meeting of his Republican caucus Wednesday to figure out how his chamber can deal with the immigration issue. The Senate has already passed an overhaul that many conservatives find unacceptable because it gives 11 million illegal immigrants a path to citizenship. July 10, 2013  House Republicans huddled behind closed doors to consider their options on immigration on Wednesday. The Senate passed an immigration overhaul that includes a path to citizenship, but conservatives in the House reject the plan. July 9, 2013  Was the change in Egypt's government a coup or not? For members of Congress, the difference is more than a question of semantics. U.S. law requires that aid be cut off to a country that undergoes a military coup — which, if it were to happen in the case of Egypt, would bring on dramatic consequences. July 4, 2013  When it comes to selling Texas Latinos on the Republican Party, Republican Sen. Ted Cruz would seem like a natural. But even though he is the son of a Cuban refugee, Cruz is much closer to his Tea Party supporters' hard line on immigration than he is to the Republicans who are urging a more accommodating position for the sake of the party's future. July 4, 2013  In a state with a fast-growing Latino population, the fight over immigration is especially relevant. There's scant backing for the Senate's immigration bill among Texas Republicans in Washington, but some Texans say those lawmakers are "behind the curve." 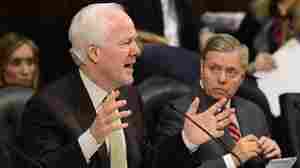 June 28, 2013  The Senate passed a sweeping immigration overhaul bill Thursday with bipartisan support. The legislation, passed by a vote of 68 to 32, would put millions in the country illegally on a path to citizenship and vastly expand border security. June 27, 2013  The Senate gave final approval to a massive immigration overhaul that spends billions on border security, increases the number of legal immigrants and also creates a path to citizenship for the 11 million people who entered illegally.